Reopening on 01 November 2019. Whether it’s a holiday or a work trip, a memorable experience awaits you. 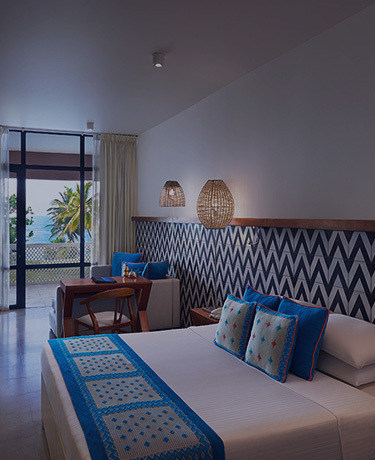 Stay with us at a chalet by the beach, a bungalow in the middle of the ocean, a lovely suite in a rustic atmosphere, a spacious room up in the hills, or an urbane room in a plush ambience. Yes, there’s enough room for all that you like. What interests you - nature and wildlife, art and architecture, adventure, gastronomy or just the opportunity to do nothing? When you’re with us, enjoy all of it. Go on a safari, or snorkel and dive for unforgettable encounters with wildlife, stroll around awe-inspiring architecture, dine at our exquisite restaurants or simply lose yourself to beautiful sunsets. How do you wish to spend your time with us – briefly for work, on a holiday with family or on your honeymoon? We’ve got you covered no matter what you’ve got on your mind. Browse through our exclusive offers and make the most of them. Take a peek at the 4.5 million sq.ft urban sanctuary, envisioned as the epicentre of modern South Asia. Success and celebrations shouldn’t come at an added cost, right? So, when you plan to host an event with us, browse through our offers and pick one that suits you the best. I consent to the use of my personal data by Cinnamon Hotels & Resorts to send me marketing and advertising materials in relation to Hospitality services of Cinnamon Hotels & Resorts and its business partners, and for research and analysis.